Twenty years ago, an unsuspecting ant crossed the floor of a basement laboratory at the University of Oregon’s Volcanology Building and laid a trail for Robert Schofield, PhD ’90. The senior research associate was then studying physics under Harlan Lefevre, now professor emeritus. Schofield was working on a new type of microscope, one that uses protons rather than electrons or light to generate an image. Fifty million years before humans developed agriculture, leafcutter ants had already begun the practice. Their crop, fungus; their soil, a mix of plant materials brought to the nest, often after being cut to size. Their agricultural skills support colonies populated with millions of ants organized by intricate communication and caste systems and living in gigantic, elaborate subterranean nests, each made up of hundreds of interconnected fungus garden chambers. They are, according to noted entomologists Bert Hölldobler and E. O. Wilson, a “superorganism”—composed not of cells and tissues but of closely cooperating individuals. The leafcutter forager caste—the ants whose job it is to cut leaves—were the ideal insects to help answer one of Schofield’s research questions: does wear matter for such tiny creatures with such short lives (an average female worker’s lifespan is one to three years)? He suspected that the large amounts of zinc found in the teeth of their mandibles, like those of the ant in his lab, made them stronger. His hypothesis was that wear-resistant mandibles were essential to the well-being of the entire colony. His plan was to set up a colony in the lab, and then compare results with a colony in the wild, to prove it. The ant colony in Schofield’s lab began with a single queen from Costa Rica. In the wild, she would have dug a shallow hole in the soil and begun to lay eggs. In the laboratory, her nest was constructed for her, as was an entire artificial landscape consisting of lengths of tubing, or trails, leading to separate glass and plastic chambers. In the lab, Schofield, tall and thin with gray-blue eyes and dark brown hair pulled back from an angular face, drops leaves of the Northwest’s infamous Himalayan blackberry into a large aquarium. The tiny red ants, Atta cephalotes, diligently cut away at the greenery, travel the tubing trails, and tend to the fungal gardens. They are everywhere. Schofield estimates there are several thousand now. He carefully picks up a writhing ant between his index finger and thumb. It doesn’t take a microscope to see that her mandibles could inflict some damage. This particular ant is a major worker, or a defender—the largest of four morphological castes, each with its particular tasks. “I like to call them the bulldozers,” says Schofield. “On a normal day when they’re not being attacked by a large animal like me, these ants maintain the trails.” Schofield points to examples of the other castes: the gardening and nursing ants, the in-nest generalists, and the foragers. The foragers are easy to spot: they are the ants cutting and carrying the leaves and the subjects of Schofield’s experiment, which began in 2004. Schofield describes how coresearcher Kristen Emmett timed how long it took an ant to cut out a leaf disc, then measured the disc, collected the ant that cut it, and photographed the ant’s mandibles under a microscope. She did this over and over. From the photographs, Schofield and his team measured the length of the teeth of mandibles. Schofield then replicated the experiment with a colony in the rainforest of Soberania National Park near Gamboa, Panama. “We could say that this ant cuts one millimeter a second, and this one cuts half a millimeter. And it turned out that the ants with the more worn mandibles cut slower,” Schofield explains. Was cutting also more difficult for these ants? Schofield built another machine to answer this second question—basically a tiny saw into which ant mandibles can be fitted like blades. The apparatus then moves the mandibles across the leaf, registering the force required to do so. The results confirmed the team’s suspicions. 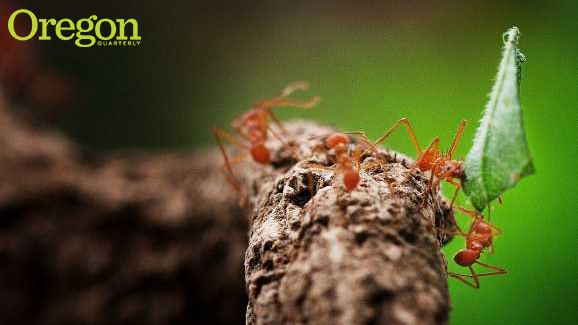 Older, slower-cutting ants use twice as much energy to cut through a leaf as newbies with their razor-sharp teeth. Can an ant really recognize the fact that she’s no longer cutting so well and then make a conscious decision to change jobs? Schofield is quick to clarify that this hypothesis has not been tested. He offers two possibilities. One, as the ants reach a certain age, genetic programming instructs them to stop cutting and start carrying. Or two, they are capable of self-evaluation. Schofield suspects the latter. “I see it as I watch them cut. If it seems way too hard they’ll give up or go find a different place and start cutting. Well, maybe if they can’t find a place they’ll just carry a leaf back instead,” he says. Schofield also believes that the leafcutters might have something more to teach us than a good fable. As humans continue to build smaller and smaller high-tech machines and tools, how might we learn from tiny creatures that have adapted to wear for millions of years? Is there something within the biomaterial of the ants’ teeth that might be useful to us? In retrospect, it might not seem like such a leap for a physicist dealing in tiny things like protons to become interested in creatures like ants. In fact, Schofield still spends half his time studying astrophysics. He is part of a group of scientists that works at two Laser Interferometer Gravitational-Wave Observatories, the nearest located in Richland, Washington. These instruments were built to detect vibrations set off across the universe when cataclysmic events occur, like stars exploding into supernovas or black holes colliding. Yet, if detected, such events would create a wave whose crest would only rise a tiny fraction of the width of the nucleus of an atom. At the heart of the project “is a very fancy measuring device,” Schofield told a reporter. “All we do is measure distance.” Here is one way to consider how something as grand as an exploding star and as tiny as a leafcutter ant can be connected: through measurement.